When lots of people use a communal resource  like, say, a cheap public bicycle-rental program  they tend to abuse it. 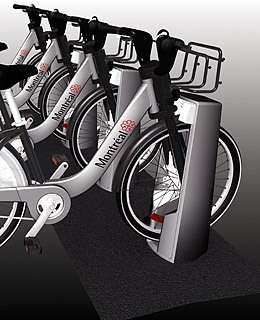 So when the city of Montreal built its Public Bike System, nicknamed Bixi, the designers packed in all the technology they could find, in a desperate attempt to out-engineer human iniquity. The modular bike-rack stations are Web-enabled and solar-powered. The bicycles are designed with tons of sealed components to resist the savage beatings they will undoubtedly receive, and they're equipped with RFID tags so they're easily trackable. Too bad they can't redesign the riders too.